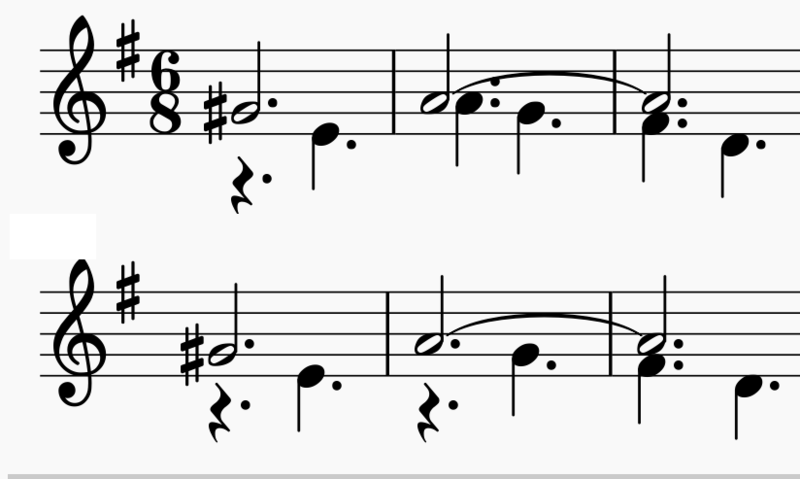 I've been trying to understand the occurance in various scores of two instance of the same note with different durations, and I've tried looking up various things to see if I can find out what I am supposed to actually play. My working solution is to play the longest duration note, and ignore the other. Today I found a score with some text that seemed to referred to them as "double stemmed" notes. Yeah! off to my ref books and the internet to look that up - but another dead end. I think it may have just been a coincidence in that piece. Please can anyone tell me the name for this and possibly explain how the are meant to be interpreted and why? But there is a "dilemma" the pianist is asked to play the same note twice at the same time with different durations (First note second bar). Obviously that's impossible - sure I can play chords or multiple voices, but this feels like a musical nonsense phrase. The second version plays the same, as far as I am aware, but does not share this problem? Q: Why has Heller, who is undoubtedly doing the correct thing, taken this first (top) approach? I also found pieces in which both the right hand and the left hand end on the same note; with it drawn on the LH and RH stave. So one hand presses the note, and the other hand presses the finger of the first hand. How to know whether a note is to be played with the left hand or the right hand? How do I play these notes from Ólafur Arnalds' Romance?